6-storey building featuring a Western exterior and traditional Islamic interior, modelled on the Blue Mosque in Istanbul. The mosque is traditionally Eastern, with Western influence to the exterior. 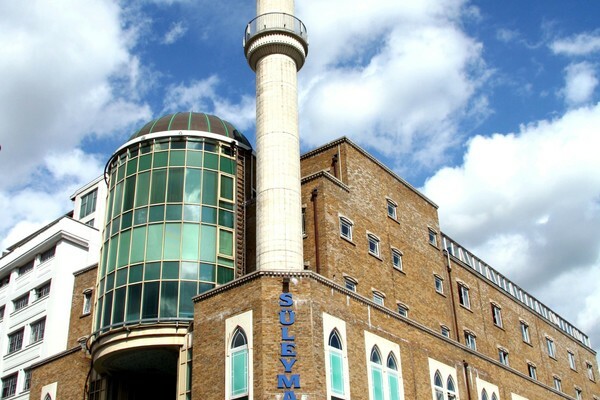 The Suleymaniye Mosque was designed to become a landmark in Hackney and integrate with the area. The ground floor was designed to accommodate service to the local community as a conference centre and wedding hall with traditional design. These two floors are the main Mosque areas. The first floor is the praying area for men. The second floor is mezzanine, overlooking the main mosque area of the first floor and is the women’s praying section. These two floors have been designed for daily and boarding students including classrooms, library, relaxing rooms, café, and residential areas. This floor has been designed for offices and meeting rooms. This floor has also been designed for accommodation purposes, but unlike the above, has been specifically aimed at visitors. They have separate bedroom/bathroom areas, with communal kitchen/lounge sections. An impressive lounge/conference area also occupies this floor. It has been designed for meetings etc. A car park is provided in the basement. This is for general use both by staff members and users of the Mosque. The Mosque has an attractive non-functioning Minaret, which provides access onto two balconies. The call to prayer - Adhan is chanted from the minaret through loudspeakers for Afternoon prayers.